When the Rockets play Bowling Green in the Glass Bowl Saturday, Oct. 6, the question could be asked: Just how much significance can you pack into one game? Not only is it a matchup between archrivals who have exactly split the all-time series (39 wins apiece, four ties), it is also the Mid-American Conference opener for UT, and it is the Rockets’ Homecoming game. Toledo has won eight straight games in the Battle of I-75. Clearly, no pre-game speeches will be needed. 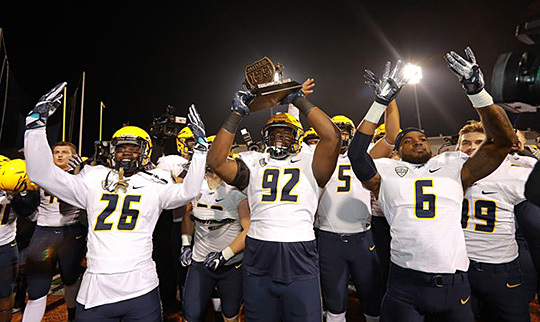 Kickoff is set for 3:30 p.m.
Toledo (2-2, 0-0 MAC) is coming off a 49-27 loss at Fresno State Saturday night. Junior quarterback Mitchell Guadagni threw for 59 yards and ran for 55 in one half of action, but it wasn’t enough to counter a strong offensive effort by the Bulldogs. Toledo held a 13-7 lead early in the second quarter, but Fresno State controlled the game after that. Guadagni was shaken up on a play late in the second quarter. Although he did return to action after missing one play, he did not play in the second half. He finished with 6 of 10 passing for 59 yards and one TD. Sophomore Eli Peters took over for Guadagni, completing 10 of 21 passes for 179 yards and two touchdowns. Guadagni’s status for the Bowling Green has not been determined. There are a limited number of tickets still available. Go to utrockets.com or call 419.530.GOLD (4653). Faculty and staff can buy tickets half off with ID, and UT students are admitted free with ID. This entry was posted on Thursday, October 4th, 2018 at 3:02 am and is filed under Alumni, Athletics, Events .